Posted on February 15, 2013 by eliefares Tagged 4GAndroidAppleiPhoneiPhone 5LebanonLTE	Comments24 Comments on Will 4G LTE Work On The iPhone in Lebanon? As of writing this post and as far as I know, the only device in the Lebanese market that is capable of running 4G/LTE is the iPhone 5. LTE enabled android smartphones have not been imported yet and the current ones in the market do not contain that functionality. However, there is one hurdle that I’m not sure if the ministry of telecommunication is familiar with regarding actually getting 4G to work on the iPhone 5. “Apple’s power over operators is often overstated, but for the first time, a carrier has confirmed that the company conducts its own tests on an LTE network before deciding whether to enable 4G services on iPhones and iPads for customers of that company. In order for LTE to be enabled on the only LTE phone in the Lebanese market so far, Apple needs to personally verify that the Lebanese network is up to par. Have we received any Apple technicians in the country to test out the 4G network ahead of the pilot phase and subsequent commercial launch in April? 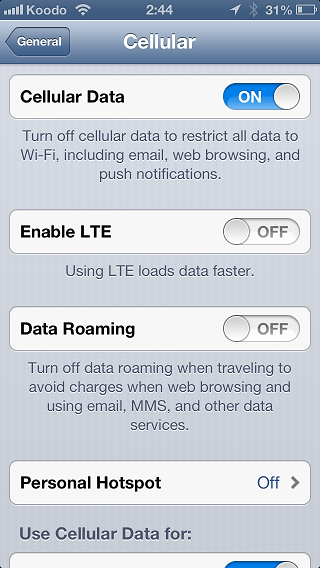 The iOS 6.1 update brought LTE functionality to a multitude of European and Middle Eastern countries. The functionality is not via activating the chip in the phone, it is enabling the toggle which allows an iPhone’s user to access their carrier’s LTE network. In order for us to receive this toggle in Lebanon, we will require another iOS update. Will Apple do one specifically for us and possibly other smaller markets in case they come and test our upcoming 4G LTE networks? Seeing as much more important markets, especially European ones, had to wait months for the 6.1 update, I doubt. I am writing this because I’m not sure if this issue has been brought up to those who are concerned with launching 4G in Lebanon. Having LTE work on our iPhones is not as simple as having the service activated on our sim cards and it also involves much more than simply having a functional network in the country’s main cities. This entry was posted in Lebanon, Technology and tagged 4G, Android, Apple, iPhone, iPhone 5, Lebanon, LTE. Bookmark the permalink. Actually it was there. I had it in my iPhone 3GS and iPhone 4 before 3G ws available in the country. Why the hell does Apple need to approve 4G networks? That’s just absurd. If this applies here, I don’t think Apple will even bother to come here and test things out! Well it’s pretty much for them to maintain/control a certain quality of service with their product offering to their customers; if you know Apple well enough, then I’m sure you would have heard them use the buzz word “experience” time and time again. I am a telecommunications engineer and I have studied wireless communications, as well as conducted some of my own research on the matter, especially recently with the 3.xG and 4G debacle. You would be surprised to know how much the network that you are connected to can affect your phone’s performance. 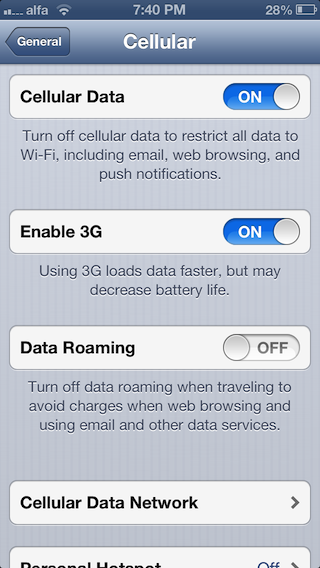 As a very simple and small example, we all somewhat experienced this last year, when 3G was first launched in Lebanon. Due to the poor reception and large gaps in coverage in most areas, people’s handsets (those who had 3G enabled) experienced severe battery drainage, just due to the signal level fluctuations, and in turn the phone’s need to keep switching from the GSM/EDGE and 3G/WCDMA access networks. Honestly, I would say take this as a blessing in disguise… I’ll explain more in my response below. Yes I agree. I replied the same way. I was one of those who developed iPhone recharge phobia when 3G was first launched. My phone kept going in and out of service that the battery simply died. When I went to France and Spain, the consistency improved battery life. And even in France, when I went to an area with spotty coverage, I noticed a deterioration as well. I’m not sure if this will be the same with 4G seeing as coverage is very concentrated at this point to Beirut mainly. You won’t have 4G coverage here, a cover less stretch there then coverage again. The problem though is the following: will Apple make the effort to actually test out 4G networks in a country where they haven’t even launched the iPhone officially yet? Thank you for the explanation. But as Elie said will Apple come here to approve? I think it’s to ensure a decent experience for their customers. I don’t think it’s a bad step if it means better service. Don’t you think anyone has already tested out 4G on an iPhone 5? I thought about it and all the tests I saw were using dongles and other devices. So I’m not entirely sure. Even when 3G tests happened, I didn’t see any tests done on iPhones. 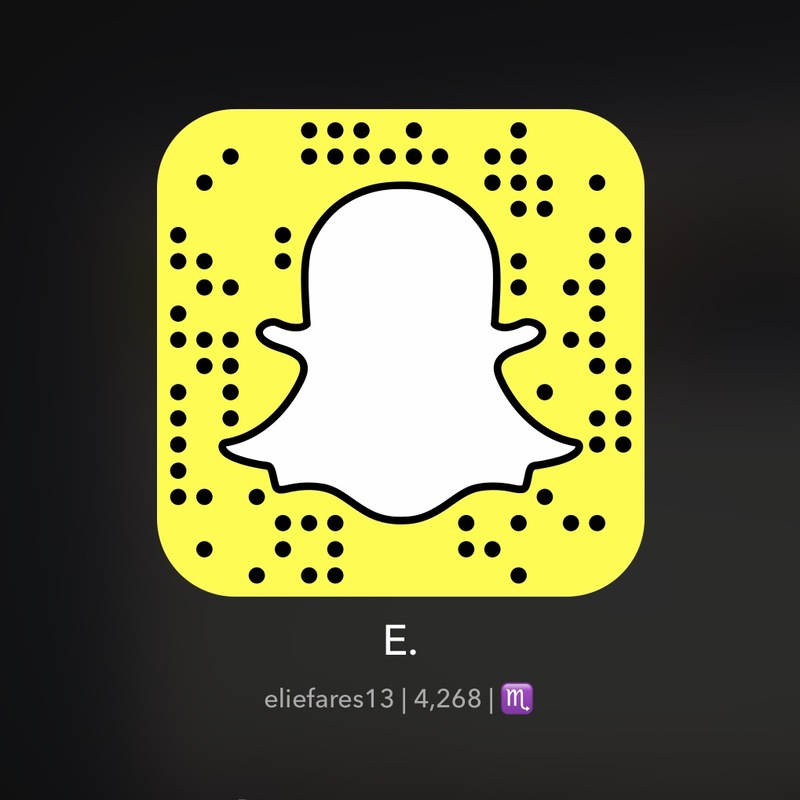 Elie (Fares), as I mentioned to Lara above, once again consider the lack of LTE connectivity on the iPhone 5 to be a blessing in disguise, for so many reasons. First, I’m going to base my opinion on news that I’ve heard so far. The data quotas in Lebanon… Yes! It always comes back to the data quotas. To the best of my knowledge, the data quotas for wireless connectivity are going to double, at best, along with the upcoming release of the supposed “LTE”. So if you’re subscribed to the 500MB package at $19, then you’ll be upgraded to a 1GB package at $19. While this is much better than what we currently have, it is still crap in the grand scheme of things. I’m not comparing Lebanon to other countries, I am making a broad statement that a 1GB quota on a 20Mbps (trying to be as realistic as possible on actual LTE performance) data rate is insanity at best. Second, and as mentioned before… battery loss and power consumption! If you’ve read any of the reviews on the iPhone 5 coming from the US, everyone’s complaining about poor battery life. Guess why that is! Most probably due to the LTE radio that is enabled on those devices. I’ve already advised a couple of my friends there to turn off LTE on their brand new iPhone 5’s and now they are more than happy with the performance of their devices. I personally have an iPhone 5 as well (model A1429 of course ;-)), and I’ve done some extensive testing on battery and data rate consumption by varying the services used, etc. Not to brag, but I’ve been able to go 36 hours (+/- 3 hours) on average on a single full charge with my phone at moderate usage, after fixing all the settings needed. There’s no way, that I’d be able to hit that level if we had LTE enabled… oh and one more thing, once you have the LTE switch then you’re stuck between LTE and 3G, and can’t turn off 3G anymore (that’s how Apple set it up, don’t know if it’s still like that on 6.1). Furthermore, to explain this any further, things will get very technical very fast, but the bottom line, GSM/EDGE uses less power than 3G/WCDMA, which uses less power than “LTE”, when on idle mode… and most of the time your phone actually is in idle mode. LTE is only more efficient than 3G when you are transferring large amounts of data (file transfers or HD video streaming), at an approximate rate of 5Mbps+, for a continuous amount of time. However, if you’re using it for Twitter, Facebook, WhatsApp, iMessage, or any similar app, then believe me it is beyond overkill. This goes along the lines of the Chinese proverb, “Don’t use a cannon to kill a mosquito”. The only company that has deployed LTE Advanced in the world today is Yota, the biggest mobile operator in Russia. In addition, and my last statement for now (I think I can write my own blog post out of this LoL!!! ), speed is not the answer. We, the consumers, are flooded on a daily basis with marketing campaigns of “superior services” being provided, and it’s always a race for the bigger number, but guess what, bigger isn’t better. A very clear example was illustrated by Intel in the early 2000’s, when they reached a limit of clock-rate with their Pentium processors, before they started producing uncontrollable heat issues. Instead of focusing on selling higher CPU frequencies, they went ahead, re-engineered the CPU, as we know it today, and came out with a completely new architecture, the “Core” architecture, which we all have in our computers today. They dropped the clock rate, but they developed much more powerful processors (by orders of magnitude). I propose the same thing for the 3G and/or upcoming LTE service in Lebanon; don’t give us a faster service, give us one that performs better, i.e. somewhat reliable/consistent data rates, reasonable quotas so we can actually take advantage of the technology instead of putting things on hold until we have Wi-Fi access, and good FULL coverage. If we get those factors guaranteed via an SLA, for example, then I honestly believe that we will be much happier and more productive in the way that we work. Looking forward to hearing your feedback, and if you have any questions, feel free to drop by my blog (http://www.technodedigest.com/) and click on the “Got a Question?” tab. I would be very eager to discuss any or all of these issues with you further in more detail. Yes as I replied to Lara as well, Apple monitoring 4G on their phones could be to ensure best quality. 1) Regarding data quota, other places are not much better actually. When you consider Americans pay $30 per month for 2GB, it is sort of comparable to here – their 2GB is also for LTE. They need to pay extra to be able to use hotspot with that. 2) Regarding use, I think the mere use of LTE will drain battery as it is very fast data, similarly to 3G, which you have pointed out. Your explanation (thanks for it) is even part of the battery life Apple tells you to expect. 3G has less life than LTE. However, seeing as LTE will only be available in Beirut at the launch, people could simply switch if off when they leave the city. The problem is that the toggle won’t be there to begin with. Coverage is much spottier in the US. As I replied to the thread between you and Lara, coverage being on in one area and off in the other is the thing that hurts battery life the most. If there’s consistent coverage in one area, I don’t think battery life would be affected as much. I’ve gone almost 48 hours w/ light to moderate use (during exam time) without charging my iPhone 5 (1429 too :P). I agree that LTE to browse Facebook and send iMessages is definitely an overkill, which probably brings us back to the quotas. But look at it this way, if we had super fast internet at home, we wouldn’t be complaining about using it to browse Facebook. 3) Thanks for the wiki links. I think we won’t have LTE advanced. Just the regular one that is deployed in the US, France and other countries. I mean, do you really expect otherwise? And I agree regarding that last point. 3G speeds that I used to get in France are superior to the ones I got in Lebanon, which are in turn superior to the DSL speeds we get. A friend sent me 3G speedtests in Dubai that showed speeds of 20Mbps. While I tend to agree that LTE is definitely going over the edge when broadband speeds are still as crappy as they are – I blogged before that it doesn’t make sense to have 100Mbps speeds on your phone and 1/100th that much at home, which is where your usage is centered. And it all really goes back to the quality of service. A friend told me that if Apple had had the same stringent requirements over 3G as they do over LTE we wouldn’t have had the initial problems that plagued the network. But the ministry involved with LTE said we wouldn’t have the same issues this time around. Perhaps it’s propaganda and perhaps it is not. I guess we’ll never know until we have it is commercially deployed and not during the pilot phase which will have less than 1000 people across the country using the service so it’s not remotely extrapolatable to the use post launch. I hope this reply wasn’t too ignorant on the issue as telecom engineering is definitely beyond my expertise (if you have medical questions, drop a line) – but the premise of this article isn’t about the worth of LTE in Lebanon or not, which is worth a blog post on its own as you said, but about a major hiccup awaiting the pilot phase that no one was probably aware of. A closed platform, and a consistent & controlled end-to-end experience across the platform: it only makes sense for Apple to approve each and every carrier’s LTE network before allowing its devices to connect to them. It’s no big deal to reach out to Apple and organize a technician’s visit and test, it’s just another company anyway and business is business. However, what I’m curious to know is whether the network’s quality is really up to par. I’m an expat, and have never had 3G in Lebanon myself but I always hear (and read) my friends nagging about the quality and the consumption caps. What I’ve experienced though during my annual visits, is having to make the same call multiple times due to the prevalent connection problems on the networks. It’s always been a Lebanese trait to dramatize and make a mountain out of the smallest molehill, but for once why not focus on making the dead-simple things actually work before moving on to higher levels? Alas … so yeah good luck! Yes I agree about the first point and I don’t mind them making sure 4G networks are up to par. It is part of the experience that their customers will have. But they didn’t do it for 3G and seeing as Apple hasn’t launched the iPhone officially in Lebanon, would they bother visiting to check out 4G networks? Based on reports I’ve been reading, constant improvement to 3G is being done as well. Some technology (forgot the name) for better penetration – no pun – will be employed as well soon to better the service. I don’t think there’s anyway to go but up. How fast we go there will differ. I think if 4G turns out to be as bug-ridden as 3G was when it launched, then the entire focus will shift there and 3G service will suffer. But yes, you are right. While I am interested in seeing how 4G will be and to enjoy the speeds that I have never witness here, waiting a couple of years and enhancing the infrastructure enough to better DSL first and foremost and then 3G seems to me like a wiser investment than splurging on another new technology altogether while the other 2, most notably DSL, are beyond lacking. Does anybody know anything regarding HTC One or sumsung galaxy S4 LTE compatibility in Lebanon ? did Sumsung and HTC released several versions as apple did with iphone 5 ? I am planning to get a high end Android phone that would work in the US and in Lebanon. If the phone is purchased with AT&T, it won’t work here. If you buy it with Verizon, it will. Guys how sure are you that the model a1428 will have lte issues in Lebanon ? It won’t work at all. Thanks elie for the great news 🙂 well I guess I’ll switch to s4 before the rumor starts to spread and the value of my phone drops ! In buying a new Iphone 6 from ATT, will I have the same problem as the iphone5 A1428? In other words, does the problem still exist with iphone6? What band do we se in Lebanon? 1800MHZ? Is there a number I should look for on the back of the iphone6?